Bowling Green Ladies Medal In Heartland Games!! at Avon Park. On Tuesday, the largest group of shufflers ever to compete in the Heartland Games shuffleboard tournament met at the Avon Park Seniors Activity Center. Two of the shufflers making the trip to Avon Park were Nancy Singleton and Lou Faulkner from Pioneer Creek in Bowling Green. (Pic on left; Lou on the left; Nancy on right.) Click on pic to expand. In the morning, men competed in seven age groupings from 60 to 64 all the way up to 90+. The ladies played in 5 age brackets from 60-64 up to 80-84. Singleton took top honors in the 70-74 year age bracket while Faulkner placed fourth in the 75-79 group. After a complimentary lunch, doubles play took over the courts in five age categories. Unlike many sports, shuffleboard doubles has teams with two women, two men or a man and a woman. Faulkner and Singleton combined to win the bronze medal competing in the 65-69 year age category. 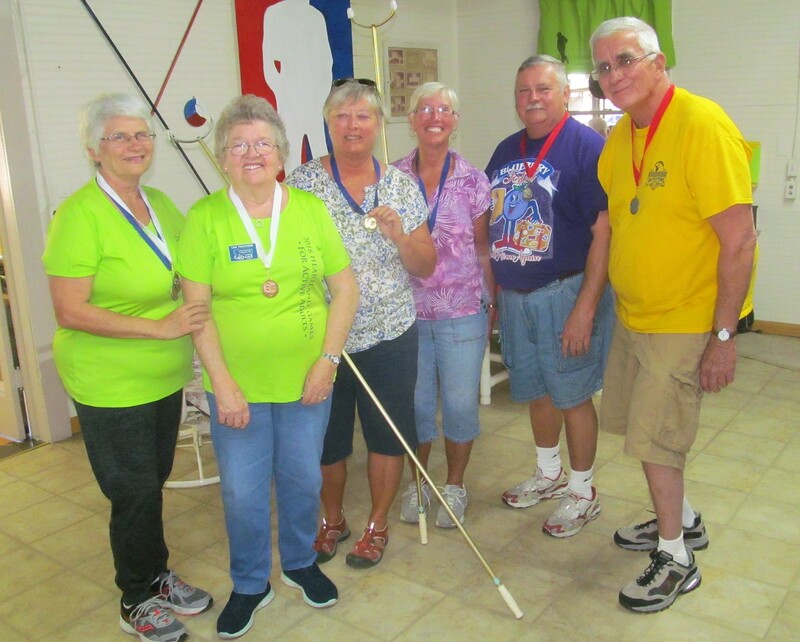 The local Games are one of twenty one qualifying events for the Florida Senior Games to be held in Clearwater in December. Both Singleton and Faulkner have qualified to play in the state games. Those doing well at the state level will earn the right to represent Florida in the National Senior Games which will be contested in Albuquerque, New Mexico in June, 2019. The Heartland Games are organized by South Florida State College. Next year’s Heartland Games shuffleboard tournament will take place at the Sebring Recreation Club on Wednesday, February 6, 2019. Story and photos by Neil Simpson. 2018 02 09.